Drum tuning isn't easy! 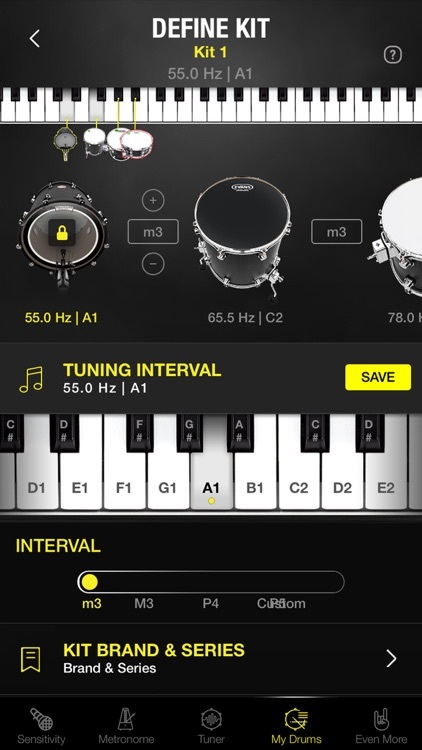 This DRUM TUNER empowers you to tune your drums with your phone to a perfect pitch! Forget the hassle of guessing lug pitches by ear. 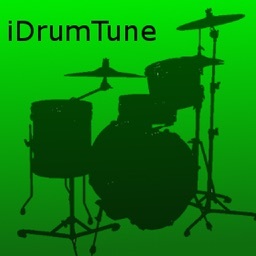 Drumtune PRO analyzes your drum sound at each hit, and tells you exactly how your drum head is tuned. 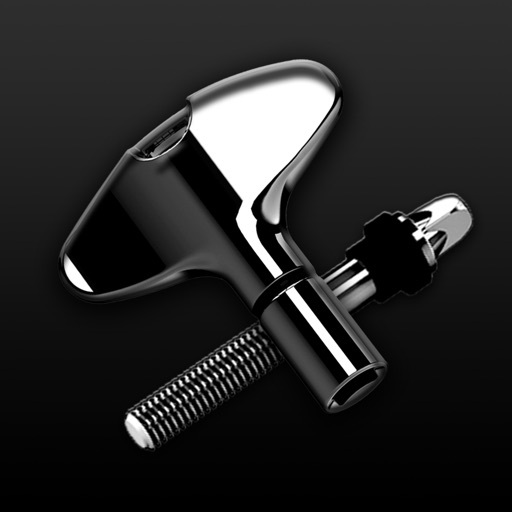 Get Drumtune PRO and get rid off the guesswork of tuning drums by ear.Tuning to perfection becomes much easier! If you have your phone with you, you'll have a drum tuner at hand! 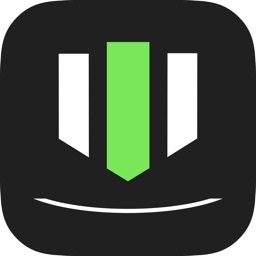 Drumtune PRO is the most complete drummer-multi tool available today. 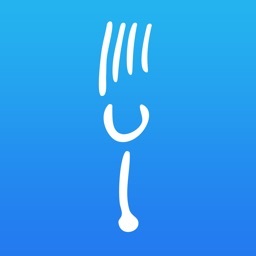 In short: Having Drumtune PRO on your phone, is like having your personal drum-tech in your pocket. 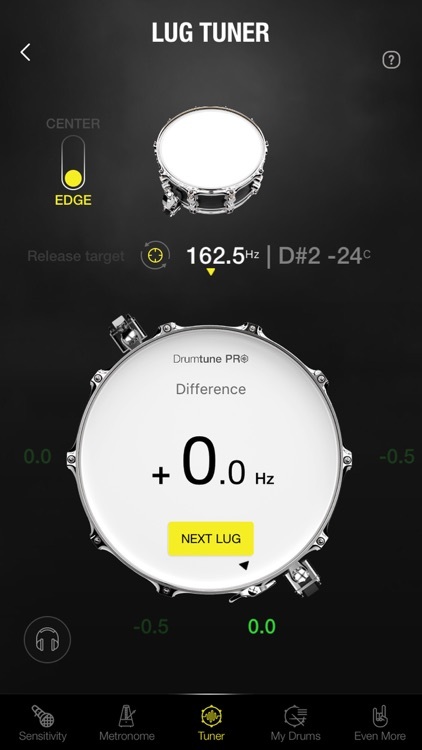 Drumtune PRO is the only drum tuner you'll ever need! Use BASIC tuner or PRESET tuner. Preset tuner is advanced. Take your time to get the hang of it. Once mastered, it helps to understand tuning better and can optimize your sound! Define and experiment with tuning intervals for all drums in your kit. Let your full kit sound as a balanced set when playing drum fills over your toms. 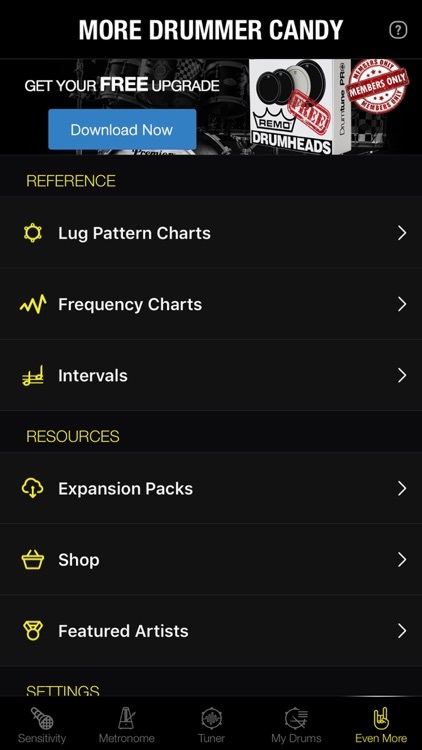 Lug tuner mode assists you with tuning your lugs in the correct pattern. It keeps track of all lug pitch differences, so you can efficiently check which rods have to be tuned up or down to obtain an even head tension. Store how your drums are tuned in customized tuning presets for your snares, kicks, toms & floor toms. Download free drum head expansion packs (Evans, Remo & Aquarian) to personalize your presets. Organize your presets in drum kits. Experiment with fundamental tones & their sustain for your drums. The app's suggested tuning targets for batter & reso get you as close as possible to your target fundamental tone. You have all the freedom like when tuning by ear: listen & explore beyond the suggested targets. Tune, listen & tweak until happy! 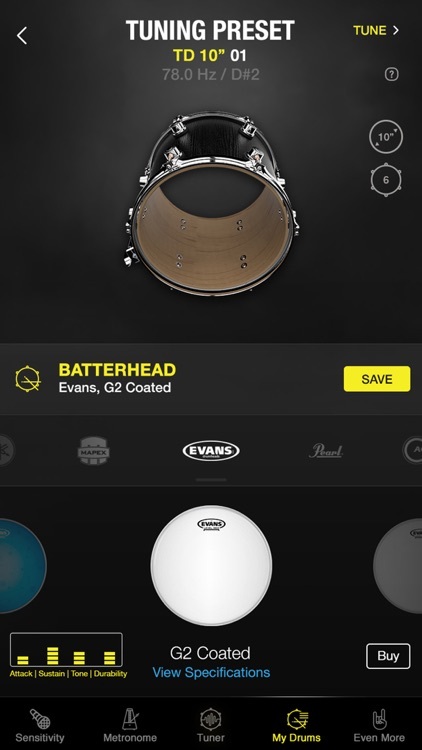 Use the app to tweak the pitches of your batter and resonant heads to create your 'signature drum sound'. Once you found your drum sound, simply measure the pitches of your batter and resonant heads and store them in a customized tuning preset. Whenever/wherever you need to tune again to the same sound, just load your customized tuning preset to precisely recreate that exact same 'signature drum sound' within minutes. You can now achieve a consistent drum sound conveniently and reliably: perfect for gigs,studio work and rehearsals. 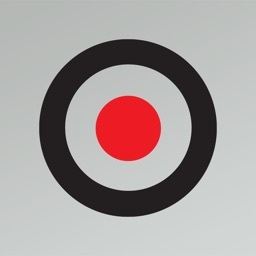 Detect difference between your actual pitch and your target pitch on a clear scale. 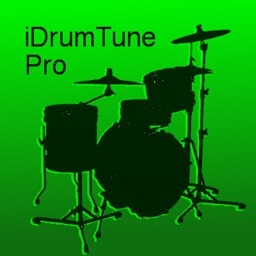 We improve Drumtune PRO based upon your input! > Direct: Shake your phone to report bugs! Pitches of a drum head tuned beyond the tuning range's limits may cause erratic/'jumpy' readings displayed as random frequencies below 450 Hz. 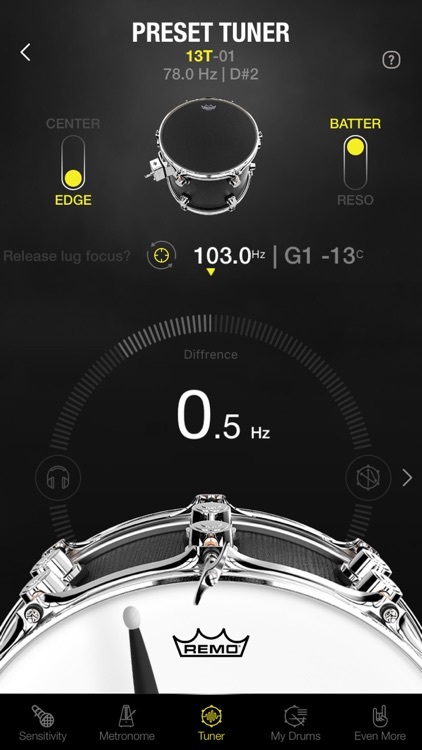 So, in case your snare's resonant head is tuned beyond 450 Hz, the app may show an erratic pitch below 450 Hz. Don't over-tighten drum heads!